Alhamdulilah, we thank Allah and thank you for your continued support and Du’aa with every step in our prolonged journey to establish a community center for the benefit of our youth and future generations in’sha’Allah. With the help of Allah and the tireless efforts of our volunteers of the planning and engineering committees, we finally reached a point of a clear path towards the end of the project. We can see the light after so many obstacles that were overcome only with persistence, perseverance and constant Dua’a and support from the community. City permitting, multiple design options, careful selection of contractors and project estimates added many delays to our original timelines, the delays could not be avoided despite our best efforts and intentions. Lease to own of additional 3.25 acres added to the original 3.0 acres to add playground and expansion areas. Land preparation: grading, streets, utility lines and water management. High quality fields and volley ball courts. Start construction in second quarter in’sha’Allah. Move in during the second quarter in’sha’Allah. We would like to complete the project in full without delays in order to keep the costs low and reduce the hassles of start/stop construction based on fund availability. With Allah’s help, your Dua’a and urgent and immediate financing we will complete the project as planned. February 17th is our annual and very important fundraiser in’sha’Allah. 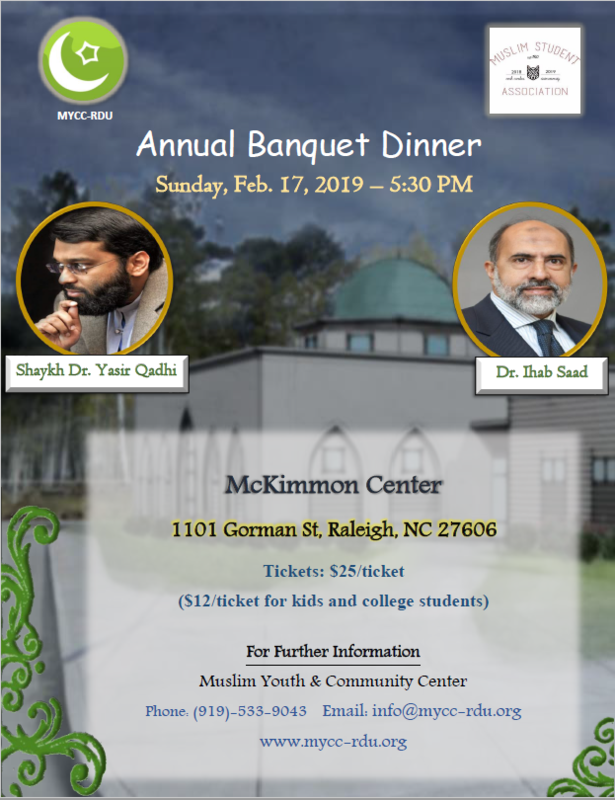 Our esteemed guests will be Dr Yasir Qadhi and Dr Ihab Saad at McKimmon Center in’sha’Allah. Online tickets are available at https://services.madinaapps.com/donation/clients/mycc please include number and names of attendees in the remarks field. More Details are in the attached flyer. Please do your best to attend with your family and encourage others in our community and surrounding communities to help us see this long awaited project to completion in’sha’Allah. Share your breakfast with brothers at the Masjid.